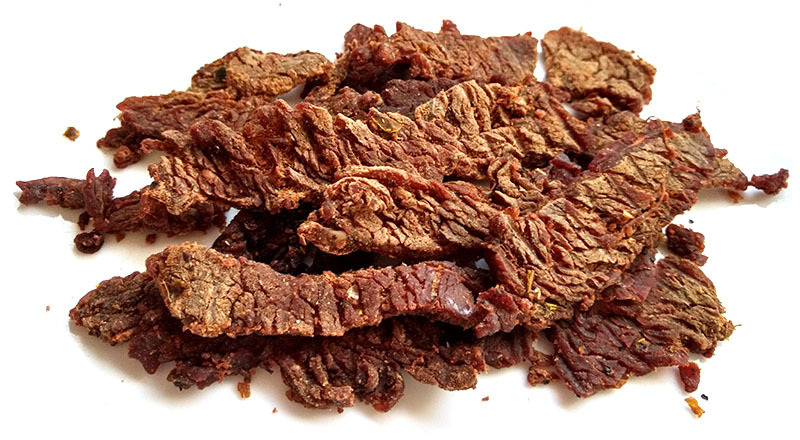 The newest flavor from Jeff's Famous Jerky is this Jalapeno Carne Asada Flavor variety. Jeff's Famous Jerky is a brand owned and operated by Jeff Richards, out of Big Bear City, CA. Jeff has been making beef jerky since the 1970s. His love for cooking took him into the restaurant business for over 20 years. He currently runs a consulting company called Creative Business Adventures where he helps entrepreneurs achieve success. In 2006 he started working on creating his own beef jerky brand, and just this year saw the launch of his new business. The first thing I taste from the surface of these pieces is a spicy, saucy flavor, with a bit of saltiness. There's a light bit of heat building up, and a well-noticed tanginess. There's also a fair amount of sweetness too. The chewing flavor starts with an increased saucy flavor, and an increased tanginess, along with a light citrus flavor. Some of the natural meat flavors show through more towards the latter part of chewing. Meanwhile the heat builds up a tad more. For being labeled as "Jalapeno Carne Asada", it seems to hold up for the most part. There seems to be a very light chile pepper flavor in this, though not necessarily tasting like jalapenos specifically. And there is a light bit of heat. I'd probably rank this as mild-medium on my personal hot scale (level 2 out of 5). But the carne asada part seems well represented. I get a noticeable amount of the lime juice, and a good deal of seasonings, much like what I would expect from carne asada. The overall flavor of this is largely that saucy flavor, very much like what I got from Jeff's Original variety. I'm sure it's the combination of soy sauce and worcestershire, but the two have blended well together, perhaps with the seasonings, to where it has its own unique flavor. There's also some sweetness that mixes into it. 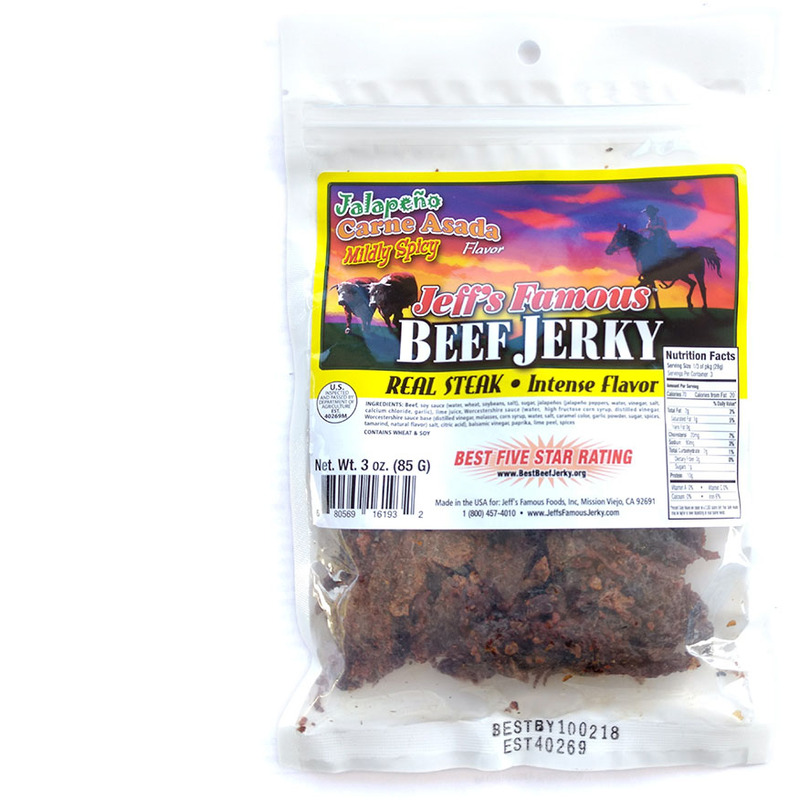 The tanginess is also a dominant part of this jerky's flavor. Jeff's jerky varieties all seem to have this, but I want to say it's even more defined in this Jalapeno Carne Asada. I'm guessing that lime juice is what's adding to it. I can even pick it up off the surface of these pieces, before I even start chewing. The natural meat flavors start coming in more towards the latter part of chewing as the other flavors start wearing off. It's a light flavor, and seems to have less of the fatty flavor that I found in Jeff's other varieties. I'm sure that's just a variance in the batches. A bit of black pepper is creating a light aftertaste in the back of my mouth. The saltiness in this feels to be at a moderate level. Overall, what you're going to notice in this is a lightly spicy, well seasoned "saucy" flavor, with a moderate amount of sweetness mixed in. There's a light touch of chile pepper flavor, and a light natural meat flavor. The chewing texture starts off feeling soft and tender with no chewing resistance. It chews down to a soft mass rather easily. At that point, it has a steak-like feel, but more soft, though not mushy. This review batch doesn't contain very much fat, unlike the other varieties I reviewed from Jeff's. I don't see any tendon or gristle, but I do get a good deal of stringiness, and some of that stringiness remains in my mouth as unchewable wads of tissue. As for clean eating, it seems pretty clean. I'm not getting any residue on my fingers, and no bits of meat or seasoning flying off as I bite off chunks. Jeff's Famous Jerky sells this Jalapeno Carne Asada variety from it's website at a price of $20.95 for a 3 pack, with each package at 3oz. Add to that shipping of $6.50, and it works out to a price of $3.05 per ounce. For general jerky snacking purposes, at the $3.05 per ounce price, it's a decent value. I actually get a lot of snackability for an excellent overall flavor, good meat consistency and decent chewing texture. That price is a lot higher than what you pay for the major brands of jerky in grocery stores, but it's a much better flavor and meat consistency. As a Jalapeno Carne Asada beef jerky at the same $3.05 per ounce price, it's a fair value. I do get a good deal of carne asada-like flavor, and a very good tasting one at that, but much less so of the jalapeno. 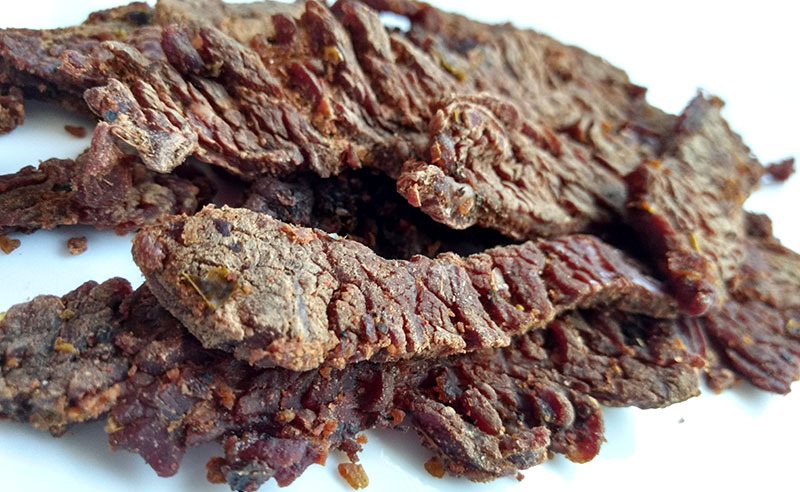 This Jalapeno Carne Asada variety from Jeff's Famous Jerky knocks out a great tasting carne asada flavor, with a tasty, saucy marinade and a very tangy, citrus-like chewing flavor. The jalapeno flavor is rather light, and even the heat is rather light as well. But it has the tanginess, the rich marinade, and the seasonings of delicious carne asada. And then the meat consistency is highly snackable, with its tender, moist, easy eating, but still renders a steak-like chewing texture. You'll even get a light natural meat flavor towards the end of chewing. Overall, I find this Jalapeno Carne Asada comparable to Jeff's Original variety, but with more tanginess, more seasonings, and even a light splash of chile pepper flavor and heat. I gave his Original variety a Best rating, and it seems this Jalapeno Carne Asada takes that Original to a higher level of meat snacking enjoyment. I'd like to get more of the jalapeno flavor and heat, but I think it still holds up to its advertised flavor, more so with the carne asada part. I can still get some noticeable heat, and still detect enough of that chile pepper flavor, that I think the Best rating is still justified. My recommended beer pairing for this, go with a dark lager, try the Negra Modelo or the Asahi Black.